When it’s pouring rain and you’re bowling along through the wet, there’s satisfaction in knowing that you’re out there and the others aren’t. Run with your heart, find a goal, and go for it! Having a goal (like an upcoming race) gives me something to strive for. Hello ladies, here is the latest news from the “nest”! There is nothing like watching the Olympics! I don’t know about you, but watching those amazing athletes and hearing their personal stories motivates me to be better at something! The amount of time and effort they put into their training is remarkable. Many won medals, but we also need to honor those who didn’t place in the top three/ten/twenty. Their efforts shouldn’t be ignored. I will suffer post-Olympic withdrawal now that it’s all over! While watching TV I was impressed with some of the commercials – until seeing them so many time became a wee bit annoying! We do need to get out and play and become a more active nation. 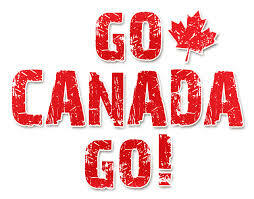 Do your part for Canada and join Nik’s Chicks on March 8th at 8am! If you are away for March Break…don’t you worry. You can either 1) Wait til you return to jump in with us or 2) Get up before your family misses you and hop on your hotel’s treadmill or head outside to begin the training program on your own time. (You will only be gone for 30 minutes!) 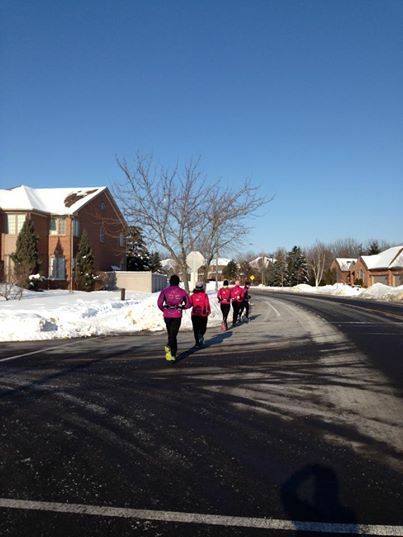 Every Spring I get excited about helping new ladies become “Chicks” and get started on their own running journeys! See you soon!! The Running Company is Closing! : It saddens me to pass along this news. Our favorite running store in Oakville, The Running Company, is closing it’s doors. It’s been a great run, however, like every race there is a finish line. You, the customers, have been like my running companions throughout this marathon. Without your support we could not have done it. Together we have had the opportunity to support local causes and events to which the community has benefited greatly. As a thank you for these last 17 years we have been in business we are hosting a final close-out sale. Great deals while supplies last. All sales final. Learn to Run 5km, 10km and Sprint Triathlon Programs begin soon: I have chatted with so many ladies in the past month that I have forgotten who has told me they will be joining the group on March 8th at 8am! Please send me a quick email to let me know that you will be coming so I have an idea for numbers: mclaughlins1438@gmail.com. I have added names to the Training Groups page for the 5km,10km, and Sprint Tri programs. If you need to make a change here, let me know. Here are the programs we will be using: Learn to Run 5km Training Program (M,Th,S) 10 Km program from 5km base (M,Th,S) Sprint Triathlon June 2014 (16 week pgm) Remember that these programs are FREE! Bring along a friend so you can coerce each other to get out the door! New Race March Race: Are you looking for a 5km in the very near future? Grab your “Green” and head to the Achilles Canada St. Patrick’s Day 5km on March 16. Register here Thanks for info, Veronica! Kids Triathlons: So you are thinking of doing a Triathlon this year and WOW….you have inspired your kids to want to do one too! Check out this site http://www.trikids.ca/registration/ and get your kids registered early. Spots fill up quickly! (Especially the Oakvillle and Burlington races) You can use the Sprint Tri program as a guide for your child’s training – make modifications based on his/her age and their race day distances! Tips from Runner’s World 2013 Daily Calendar: 1) Even after a day full of negatives, stop your internal debate and manage the moment. Those downers can keep you inside the house. Instead, counter with positives, such as “I’ll have more energy after I run.” 2) A good yoga pose to help relax running muscles: side Bend – Lie sideways over pillows, keeping hips and shoulders on the ground. Hold for 5-15 minutes. Repeat on other side. 3) Running every other day allows “weak links” – your knees, feet or hips – time to heal. Do long, slow runs on the weekends when you have more time. Weekdays are ideal for shorter hill and social runs, say, Tuesday and Thursday. If you are doing speed workouts, it’s essential to take a rest day before and after in order to rest and recover. Saturday – March 8 8:00am New programs begin today!